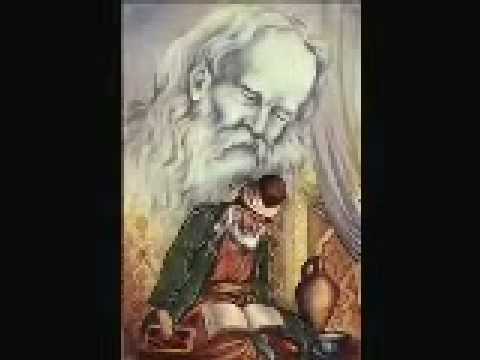 Shams-i Tabrizi was a wandering mystic who became Rumi’s beloved companion. Rumi had been a sober scholar, teaching law and theology to a small circle of students, but the coming of Shams turned him into a devotee of music, dance, and poetry. Another story runs somewhat like that of Mansur Al-Hallaj. Once a king’s son died. The king was distraught and wanted his son back at any cost. He was told that this was only possible thru Aayats (divine verses) of The Holy Quran. All the Islamic scholars were summoned (including Rumi) but they were at a loss what to do. Rumi said that-yes there indeed ARE such aayats in the Quran, but we are not the people who have actually internalized the Quran this way. The king threatened to kill all the scholars unless his son was brought to life. So they started searching for the right man. While traveling through jungle all of a sudden they heard the sound of “Allah Hu” coming from somewhere. They followed the direction of the sound and reached a place where Shams-e-Tabrizi was sitting under a tree. And they saw that the sound was emanating from the very pores of his skin. Once in the presence of the King, Shams recited the Aayat which said- come to life by Allah’s order. But of course, the child didn’t revive. He again repeated the aayat- “Come to life by Allah’s order” but still, the child lay dead. In anger Shams said- “Kumbe-izni” (come to life by MY order), and the boy revived. In any case, Rumi had found his friend, philosopher, guide-virtually his alter-ego. For years their mutual discourses/ discussions and companionship continued. Shams, for him, was the manifestation of all that was of everlasting beauty. He was inebriated with the divine beauty in him, and Shams delighted in the extremity of his passion. But, jealous of the growing intimacy, Shams was later killed by Rumi’s own disciples. Hiding the truth from Mevlana, his followers tried to comfort him saying: ”Shams has gone again, but he will be back one day”. ”Seekers, see what you will, him or me. See either him, or me, for I am him, and he is me”. In his later poetry, it is Shams who is talking through Rumi. Rumi said this in a number of places. The Mathnavi and Divan of Rumi are said to be written like this- i.e. Shams who talked through Rumi. He. His essence speaks through me. Another story runs somewhat like that of Mansur Al-Hallaj. Once a king’s son died. The king was distraught and wanted his son back at any cost. He was told that this was only possible thru Aayats(divine verses) of The Holy Quran. what a great story about Shams raising the dead boy! thanks for sharing; I’d never heard this one before. it reminds me of some of the accounts of another amazing wild avadhut character, Shirdi Sai Baba. A very informative article by Aparna-ji about Rumi and Shams. Very few know the details of Rumi’s teacher. Thank for enlightening us Aparna-ji. Alx, a similar statement is accredited to Mansoor Al-Hallaj, who would fall into trances which he attributed to being in the presence of God.